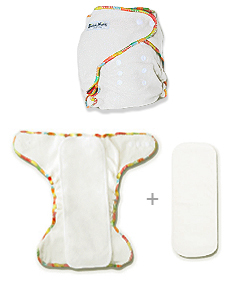 Think of 'Fitted Nappies' as inserts (sponges) that are shaped just like a nappy. 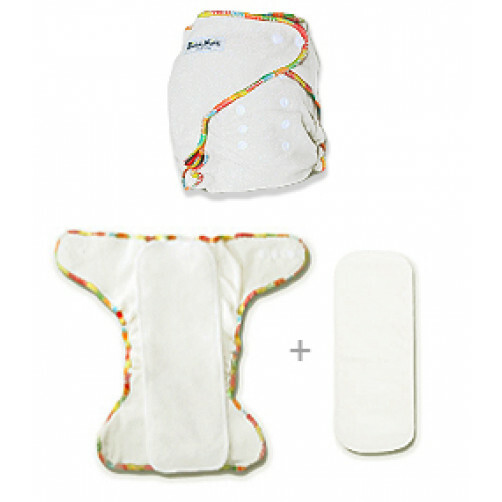 All the layers of a fitted nappy are absorbent (but not waterproof) and there are size adjusting snaps on the outer layer.This maximizes the surface area of the absorbent layers - which completely wrap around the little one's bum, and because it has elastics and size adjusting snaps, it really locks 'everything' in. Essentially, fitted nappies FIT around baby. Since fitted nappies maximize absorbency and really lock-in runny poo they are ideal for use during newborn stage as day and night nappies. Remember that newborn fitted nappies are the inner absorbent layers and must be used together with a newborn PUL waterproof cover. Newborn specific size fitted nappies are for use during the day and night. For full time use we suggest about 25 fitted nappies and about 6 PUL covers.